The stage is set at Scotland’s oldest working theatre for a CHARITY fundraiser with a difference! On Valentine’s Weekend, Saturday 16th February, the team are offering a spine-tingling alternative to the more traditional candlelit dinner. Instead they invite guests to spend a whole night in the reputedly haunted Theatre Royal Dumfries, absorbing the history, discovering spooky tales and supporting an amazing local charity in the process! 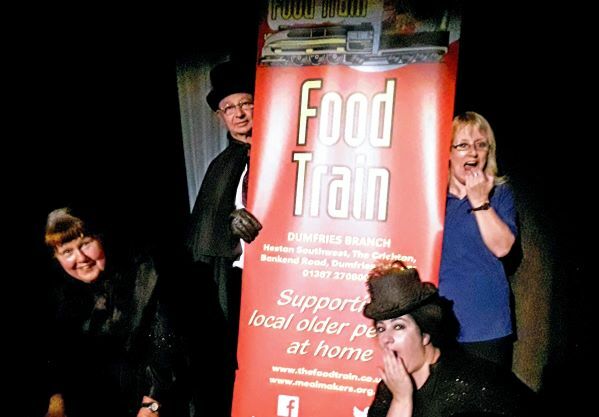 Award-winning tour guides and storytellers Mostly Ghostly Tours and local charity Food Train have teamed up for a ‘spooktacular’ fundraising event. Mostly Ghostly recently celebrated their 10th anniversary and wanted to do something special to mark their decade. The evening starts at 10pm with a magical introduction from upcoming young magician Ryan Stokes who will bring a unique and intriguing aspect to this special event. Guests will then be guided around the hidden areas of the Theatre, as the team reveal episodes from its 226-year history followed by midnight snacks. The event ends at 7am next morning – for any souls brave enough to stay that long! Those taking part are asked to pay just £35 for this unique experience, or alternatively, they can raise a minimum of £50 through sponsorship. All profits will be donated to the Food Train. The Spooky Sleepover takes place on Saturday 16th February from 10pm-7am. Tickets and sponsor forms available from Midsteeple Box Office.Established in 2008, Mostly Ghostly are award-winning creators of a range of ghost and local history tours including: the Dumfries Ghost Walk and Haunted Theatre Tour. Food Train Dumfries and Galloway Food Train is based in Dumfries and supports older people to live independently at home. They help older people across the region by providing fours services: including grocery deliveries, a household help service, befriending and MealMakers.